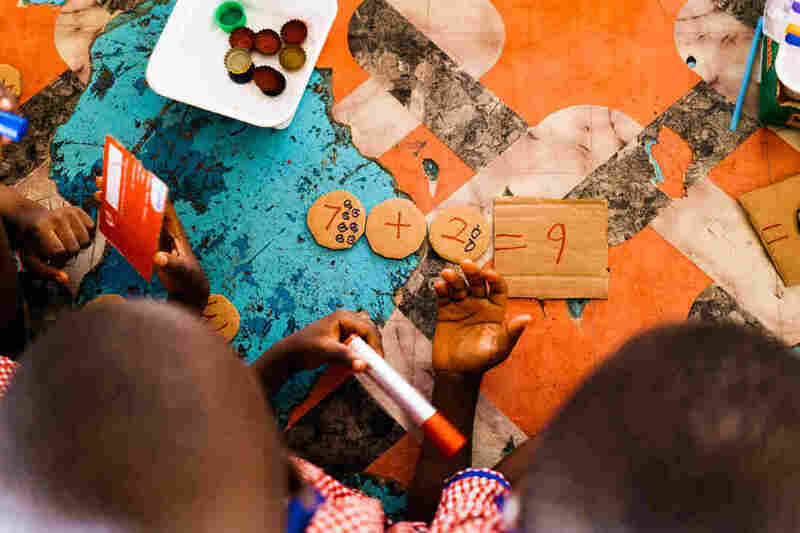 A Preschool Experiment In Ghana Faces An Obstacle: Parents : Goats and Soda Parents in Ghana's capital city have embraced preschool as a way to vault their kids into a better future. But the children aren't learning. And the reason may surprise you. It's their nightly ritual: Herman Agbavor sits down with his 5-year-old son, Herbert, to go over his homework. Every evening after dinner, Herman Agbavor and his 5-year-old son, Herbert, have a ritual. Little Herbert climbs into his dad's lap, unzips his book bag and they go over his kindergarten homework. The two of them have been doing some variation of this homework routine since Herbert was 1. That's when Agbavor first enrolled the boy in preschool. They live in a working-class neighborhood of Ghana's capital city, Accra — in a cement block apartment in a multifamily house that has a television and lots of books but no indoor plumbing. This story is a partnership with Rough Translation, a podcast about how the things we're talking about in the U.S. are being talked about in other corners of the world. This summer, the podcast will focus on "the go-betweens" — people trying to cross a bridge from one world view to another. A few minutes into their session on a recent evening, they get to a page with instructions to trace some rectangles. The boy falters. "T-R-A-C-E," says Agbavor. "What does it spell?" "Te?" offers Herbert in a small voice. "You've got to learn how to read," Agbavor says intently. "It's very important. I'm not supposed to be reading for you all the time!" In Ghana right now there's a lot riding on getting your child to read by age 5. No one can pinpoint precisely when these expectations started. But there's a widespread sense that Africa is rising. Just last year, Ghana ranked among the world's fastest-growing economies. And like many parents, Agbavor is convinced that all sorts of jobs could be opening up for people who know things — skills like speaking English and working with computers. And so there's a trend here. Parents — even those with very low incomes — are putting their children in private schools at younger and younger ages. This hope around preschool is something you see around the world. In rich and poor countries alike there's a recognition that quality preschool can give children an invaluable start in life. And in the U.S. there's a major push underway to get more children enrolled. 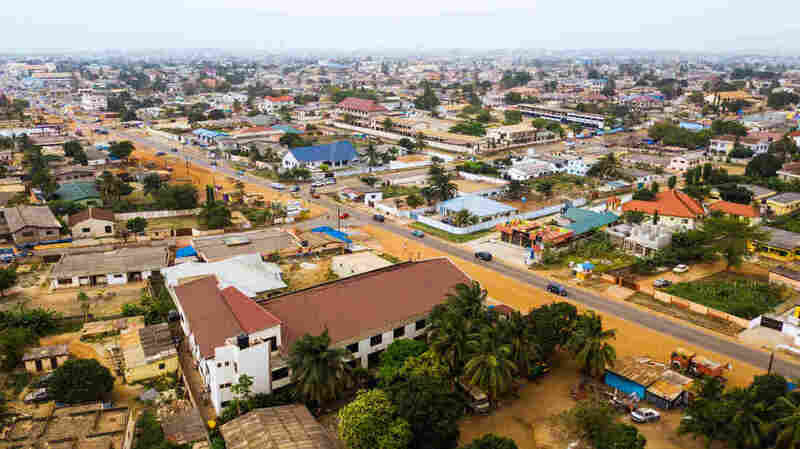 But in Accra — and in fact in many fast-growing African cities — they've already achieved that. It's estimated that in Accra by the time children reach age 3, 80 percent of them are in preschool, twice the share in the United States. But there is a problem with this picture. 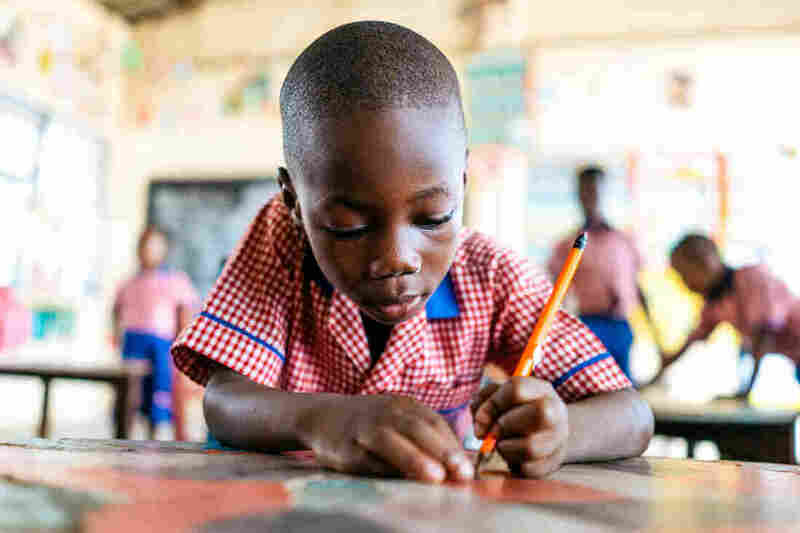 The government has tested Ghana's children as they move on to elementary school and has found that the preschool boom is not fulfilling its promise. To cite just one statistic, among second-graders tested in city schools, one-third could not read a single word of a simple story. The results on basic arithmetic questions are similarly disappointing. 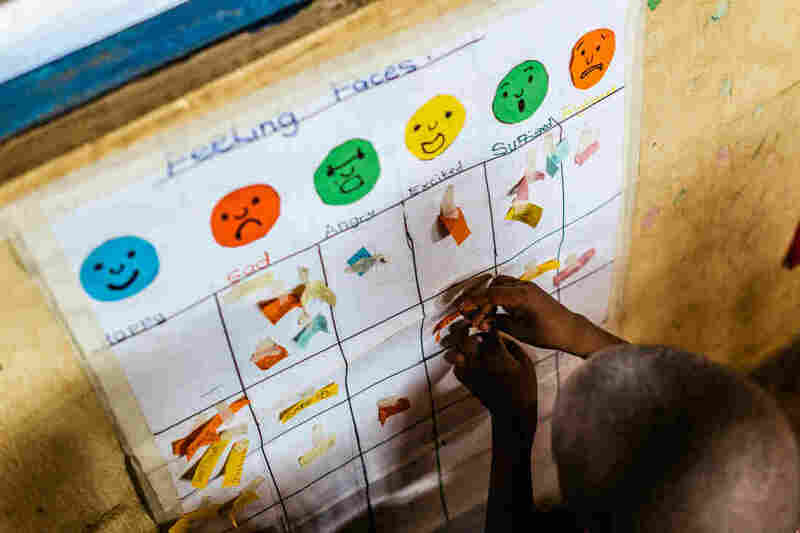 In short, when it comes to preschool in Ghana, "children are not actually getting anything from it," says Sharon Wolf, a professor of early childhood development at the University of Pennsylvania. "They are not actually learning." Wolf is one of several experts the government has turned to in an attempt to address this problem. Three years ago officials asked her and several collaborators — including an international research group called Innovations for Poverty Action — to set up an experiment aimed at overhauling Accra's preschools: a training program to get the teachers to completely rethink their approach to teaching. Does raising kids have to be stressful? Is it really dangerous for babies to sleep with Mom? Do chores have to be a fight? Over the next month, NPR travels around the world for ideas to make parenting easier. Sign up for NPR Health's newsletter to get the stories delivered to your inbox. And at first the experimental training program was remarkably effective. But then the effort ran into a wall. The very people who are most desperate for Ghana's kids to succeed — the moms and the dads — started getting in the way. Four hundred forty-four teachers were selected for the training experiment. 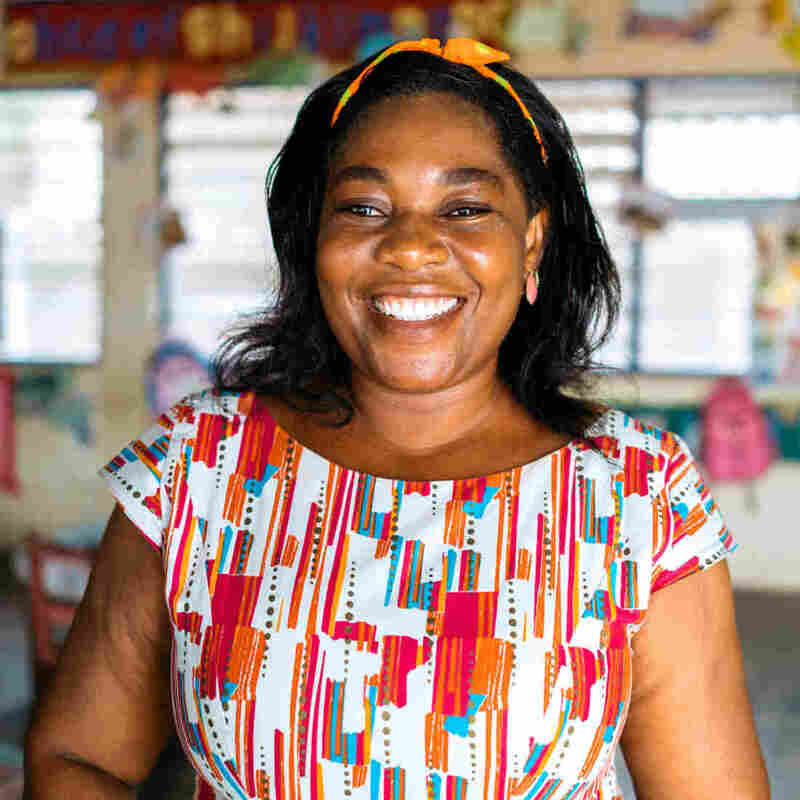 One of them happens to be Herbert's current teacher, a 41-year-old with a beaming smile named Godaiva Gbetodeme. She was a particularly eager recruit — because she had been trying to figure out how to be a better teacher for years. Gbetodeme had gone into teaching more than two decades earlier, at age 20, mainly because she needed a job. Her mother had died and she needed to support her younger siblings. She didn't have any special skills, just the rough equivalent of a high school diploma. "So I had to hustle here and there," she says, chuckling. And she had noticed that there were all these preschools popping up around the neighborhood, most of them privately run. The owners didn't care that she had no teaching credentials. Few of Ghana's preschool teachers do. But what started as just a job had almost immediately turned into a calling for Gbetodeme. She just loved being around the children: "I realized that's what God has planned for me." And to her that meant she shouldn't just wing it as a teacher. "I have to get into it fully." She tried getting advice on how to be a good teacher from the owners of a succession of preschools she worked at. Their answer, invariably, was "more homework." As in: "Why don't you give the children three homework [assignments]. Why don't you give them four?" And that is what the parents seemed to want. They would open their child's backpack in front of her, she recalls, "and say 'Oh! there's no homework in my child's bag.' So I would say, 'Don't worry. We will double the homework for your child on Monday.' "
Gbetodeme says her next attempt to learn how to be a teacher was a kind of spy operation. "Yes," she says, giggling, "don't laugh at me." She had noticed that there was another preschool not far from her home that charged three times as much tuition as the school she was teaching in. Maybe she could learn something from them, she thought. So "I went there in a pretend manner" — masquerading as a parent to get the headmistress to show her around. And she was blown away by what she saw. "I was like, oh wow!" she remembers. Gbetodeme's own classroom was a spartan place — with bare cement walls, not a single poster for the children to look at. This expensive school's classroom was filled with books and toys. "Legos in different shapes and sizes," she recalls. Gbetodeme tried to make the case to her own headmaster that they should buy things like this for her classroom. She says he told her, this is a school for working-class parents. We don't have those kind of resources. "There is no money," she recalls. "They always complain that there is no money in my school." So Gbetodeme returned to her classroom defeated. It wasn't until the researchers came along that she would find out there was something she could do to dramatically improve her classroom — a missing ingredient that wouldn't require money but rather was a fundamental reconception of how she should relate to her students. 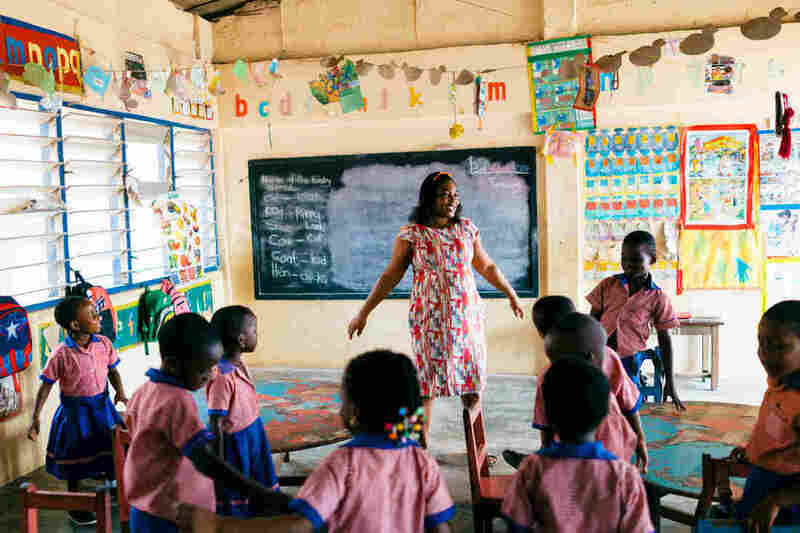 Gbetodeme has been teaching preschool for more than 20 years: "I realized that's what God has planned for me," she says. Before launching the experiment to train teachers, Wolf, the researcher from the University of Pennsylvania, ran some tests on groups of preschoolers to figure out how much they knew. "One way is by showing a picture and asking children to tell you what they see," she notes. For instance, a landscape with lots of animals. Then, you count the number of words the kids say as a way to gauge their vocabulary skills. But when Wolf tried this common test with Ghana's preschoolers, "we would just get blank stares." If the tester pointed to a specific animal the child could name it. But when the kids were asked, just generally, what do you see, they were stuck. They did not know how to offer their own observations and opinions in answer to an open-ended question. "It became very clear that children are not really getting opportunities to do this in school," says Wolf. And as she started visiting Accra's preschool classrooms it became clear that this was the result of a very particular style of teaching. We get a sense of what this approach looks like on a recent morning when we walk into one of the preschools Wolf has been studying, just as class is about to begin. About 40 toddlers take their place at rows of wood tables. Their teacher walks to the front of the room and turns to face them. "Attention!" she calls out crisply. The children rise as one, snapping their hands to their sides. Almost immediately the teacher launches into a vocabulary lesson in English — the language used by officialdom in Ghana but not the language spoken in these children's homes. "Shoe!" she shouts, holding up a flashcard with a picture of a shoe. "Shoe!" the kids shout back. "Shoe! Shoe! Shoe!" Next up, a picture of a nose. "Nose!" shouts the teacher. "Nose! Nose! Nose!" shout the children. Then it's time for Roman numerals. 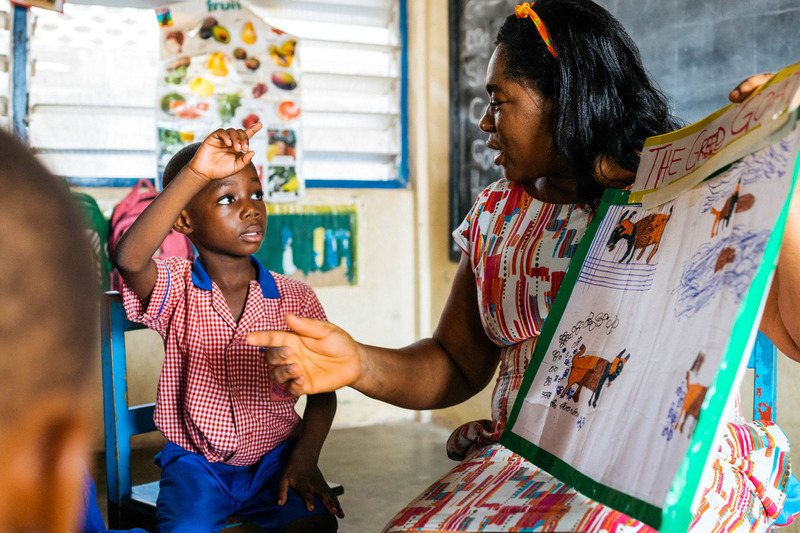 It looks academically rigorous, but there's a serious deficiency, says Margaret Okai, the government education official in charge of Ghana's preschool and elementary schools. The teachers are exclusively focused on rote memorization. "When you enter their classroom you realize they are not able to engage the children. They'd rather stand in front of the children," she says — lecturing to the students and making the children repeat it back. 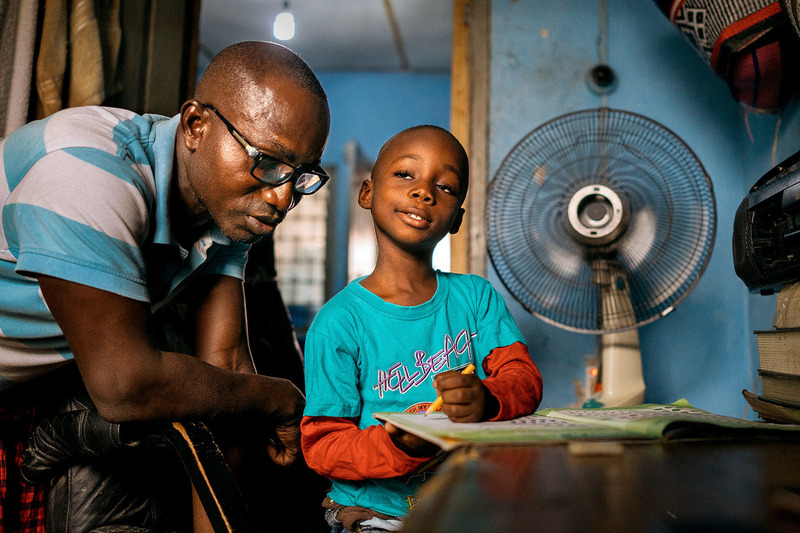 When we describe the scenes we've been seeing in Accra's preschools to Herman Agbavor — the father who was doing homework with his son — he immediately nods in recognition. "Back in school we used to call it chew and pour," he says. Meaning, for each possible question, the teacher gives you one correct answer to memorize — or "chew" — so that come test time, you can regurgitate it — "pour it" back to her verbatim. "And then," adds Agbavor with a chuckle, "you forget about it. Nothing is retained." People in Ghana laugh about chew and pour because it's always been this way. It's not something they expect to change. They complain about it the way Americans gripe about standardized testing or how children are given the whole summer off to forget everything they learned during the year. But the consensus among researchers and government officials is that at least in preschools, there's an urgent need to scrap this method. Instead of forcing kids to stare at a chalkboard or a flashcard, Okai says, teachers need to come up with hands-on activities using objects that children can touch and manipulate. And most crucially, agrees Wolf, instead of training them to spit out set answers to a list of questions, teachers need to ask open-ended questions that "draw out children's ability to think and reason." This was the missing ingredient in Gbetodeme's classroom. So how do you turn a chew-and-pour teacher into a different kind of educator? The experimental training program that Wolf designed took place three years ago. It consisted of a week of intensive instruction, followed by two shorter refresher courses and monthly classroom visits from a coach over the course of a year. And it was chock-full of practical tips — activities teachers could use to get students to express themselves. But for Gbetodeme the most important takeaway was deeper. Sitting at the training center, she began to realize that if she wanted children to really answer, and not just give blank stares, she didn't just have to ask different questions. She would have to become a different kind of teacher. "I learned that as a teacher I should be approachable. I should be their friend," she says. Meaning she needed to get on the children's level — even literally. "Like if they sit on the floor, I sit on the floor with them." Until the trainers suggested this, Gbetodeme says, it would never have occurred to her to interact with her students this way. "I felt that, 'I'm the teacher. You are my students. I'm educating you,' " she says. In other words, her role was to be the authority figure — to command respect. At first she was skeptical. This idea of asking kids questions about their thoughts and feelings and waiting for them to answer — that might work in the United States, she thought. But "this is Ghana. We are supposed to handle kids our own way." A child shouldn't be the one to initiate a conversation with an adult. Kids shouldn't look adults in the eye, even. You were supposed to be afraid of teachers. "It's part and parcel of us," she says. She remembers a time one of her own teachers knocked her in the head. She was 16 years old. He was the French teacher. He caught her trying to sneak a few peppers out of the cafeteria. Gbetodeme used to think a teacher needs to be an authority figure who commands respect — if necessary, by "knocking" kids in the head. Now she has a new philosophy: "As a teacher I should be approachable. I should be their friend." "I had a severe headache for two days," she says. When she became a teacher, she followed the French teacher's example. "Let me be frank," she says, "I knocked their heads. When they would do something bad I'd just ..." She gives the table a hard rap. But in the experimental training program the instructors made the case against intimidation by bringing up brain science. "When we're scared," says Wolf, "those parts of our brain that can absorb information and are used in learning actually shut down." And sitting there, Gbetodeme started to rethink all the experiences she'd had. "It kept flashing back into my brain." Like that time the French teacher had knocked her in the head. It wasn't just physically painful, she says. It was humiliating. She wasn't allowed to leave the cafeteria until lunch was over. So in front of everyone she put her head down on the table, "and I wept." Soon after, she dropped his class. She never studied French again. "I didn't even want to see his face. I hate him up until today," she says. And reflecting on that memory, Gbetodeme realized that several years earlier she had done the same thing to one of her own students. A boy named Chris "was doing something naughty," she says, "I don't remember exactly what." So she hit him hard. Now when she runs into him she sees the same hatred in his eyes that she feels toward her French teacher. "That boy," Gbetodeme says sadly, "will not forgive me." All those years that she had been following the traditional script, "I realized that I had been harming the children." Gbetodeme came out of the training and made a vow to herself: She would never lay a hand on a child again. Never even intimidate a kid. It was going to be a different kind of space in her classroom. A different kind of Ghana. Walk into Gbetodeme's class today and the contrast with the typical preschools around the neighborhood is remarkable. Her room is awash in color. Every inch of the cement walls is covered with posters depicting numbers and words and animals. There's a pretend shop filled with empty food boxes and household supplies where children can "buy" the items with pretend money. The training program taught her how to use everyday supplies to make teaching materials. Bottle caps, cardboard boxes, "even the tube inside the toilet [paper] roll," she says. But the most notable difference is how Gbetodeme treats her students. Gone is the knocking. She never even yells — just calls them to attention with a cheerful "Hello!" or a ring of a bell. And if they occasionally misbehave — she talks it through with them. When a boy shoves Herbert as they wait to wash their hands, she says firmly but soothingly: "Michael, why do you like fighting? We say children of God should not fight. Say sorry to him." There are still a few chew-and-pour exercises. But throughout the day Gbetodeme finds all sorts of ways to engage the kids in open-ended conversations. It starts with calling the children to a poster with faces on it — one happy, another sad, another angry, another surprised and so on. The children take a sticker with their name on it and place it under the face that reflects how they feel in that moment. Herbert puts his name under the grinning face. "Why are you happy?" asks Gbetodeme. "Because my mother will buy me a toffee," he exclaims. "Oh!" says Gbetodeme, laughing. "Will you be bringing me some of the toffee?" "Yes," he says shyly as the other children giggle. Gbetodeme is not an outlier. Across the board, Wolf found that this short, very basic program prompted teachers to substantially change their teaching practices. Best of all, that change translated into better learning outcomes for their students — who scored higher on tests of pre-literacy, pre-numeracy and social emotional skills than did children taught by a control group of teachers who did not get the training. "That was the thing that really floored me," says Wolf. She also found that of all the various changes the teachers made — like more hands-on activities and no corporal punishment — what made the most difference in the children's performance on academic tests was when teachers engaged in the open-ended questioning. This suggests something of a paradox: Ghana's chew-and-pour classrooms may be unsuccessful at teaching early reading and math precisely because they are so squarely focused on teaching this material. And the teachers in the training program had more success at getting children to read and do math precisely because they moved away from such a strong focus on outcomes and focused instead on the process — basically building up the thinking and reasoning skills that children need to learn. "We didn't train the teachers on how should you be teaching the alphabet," notes Wolf. "We just trained the teachers on how to make their classrooms more child-friendly." But then the experiment ran into an unexpected obstacle. Herman Agbavor says he enrolled Herbert in preschool at such an early age because he himself didn't have that opportunity. Agbavor is stuck in a job he doesn't love. And he thinks it's because he didn't get the right start. He would have liked to be a doctor, he says. Most recently he has been working toward getting certified as an airplane mechanic. But right now he works at the airport, filling out paperwork on the planes that come in. For his son, "I would love for him to be a doctor or a pilot or a pastor," Agbavor muses. But most important, he says, is that Herbert get to choose his passion. The thought that this future is within Herbert's grasp fills Agbavor with hope. But also with anxiety. Because right now Herbert is not reading at the pace Agbavor thinks he should. He knows his alphabet, "but when it comes to reading a full word, he's messing up," says Agbavor. The realization feels like a punch to the gut for Agbavor. Herbert is only 5 years old, and already Agbavor worries he may be failing him. So earlier this year Agbavor stopped by Gbetodeme's classroom to make a request. "He told me I should lash his son for him," recalls Gbetodeme. She considers the boy eager to please and generally well-behaved. And yet here was his father looming before her, giving her this message. "He said, 'Lash Herbert for me. He's naughty. He's not learning.' "
Agbavor says he was just trying to "give her confidence" to get Herbert to buckle down more — and to let Gbetodeme know that he wouldn't complain if she needed to put the boy in line. But Gbetodeme says it felt like criticism. And in that moment — despite all her vows to be a different sort of teacher, one who no longer relies on intimidation — she slipped a little. She says she called out to the boy: "Herbert, did you hear? Did you hear what your daddy told me to do to you?'" And she says, Herbert, normally so full of pep, "he became kind of timid." As slips go, it was not hugely dramatic. But it's telling because of another — less hopeful — finding from Wolf's experiment. In addition to the group of teachers that got the training (Gbetodeme's group), Wolf created another group, training the teachers but also bringing in parents of their students to see a video on the importance of activity-based learning and encouraging them to be more involved in their children's education. Here's what she found: The teachers in that group didn't change their teaching style to engage the children in open-ended conversations. And the children didn't make gains in test scores. Why this happened is a bit of a puzzle. But Wolf found what she thinks was a clue. In some follow-up interviews she did with both parents and teachers, it appeared that the training program made parents more prone to complaining about their children to the teachers — to say things along the lines of what Agbavor told his son's teacher. Wolf hypothesizes that giving up the chew-and-pour approach "was really going out on a limb" for these teachers. So in the face of even indirect pushback from parents, the child-centered approach "was the natural thing for teachers to step back on." Agbavor seems genuinely surprised to learn that Gbetodeme took his instruction to her as a criticism. He also was not aware that she had had the experimental training. He hadn't even realized she was using a new approach in her classroom. He has never actually observed her in action. When I fill in him, he's intrigued. It would be great for teachers to give kids more opportunities for hands-on learning, he says. "I believe in the practical," he says. "If you just have theory and you can't practice, it's useless." But as we discuss how he, as a parent, can make sure that Herbert's teachers do better, he reverts to the same focus on outcomes — on the trappings of learning — that gave rise to chew and pour. "It's step by step," he says. First the child needs to know the alphabet, "then from that to form sentences." "And if I tell [the teachers], by the end of this year he should be writing then they'll know that." They'll make it happen. He doesn't see how he can let up on his focus on results. He can't just step back and put his faith in the school. "Herbert is my first son," he says. "I don't want him to regret in the future that, 'My father couldn't do the right thing for me.' "
Agbavor brings up an expression in his language, Ewe: "If you're a one-eyed man, you don't play with sand." It could get in your eye and "you don't have an eye to spare. A one-eyed man doesn't play with sand." As a parent, did you ever push your child in ways you now regret — or not push enough? Or when you were a child, did you ever feel pushed too hard or not enough? Share your story in the tool below. We are collecting responses until June 27. We may feature your post on NPR. Our submission deadline has passed. Read some of the responses here. Thanks for participating! A previous version of this story incorrectly spelled some references to Godaiva Gbetodeme's last name as Gbetodome.